Published on January 3, 2014 by Martyn. Be the first to comment! The new year has got off to a great start with a wonderful write-up for my new teen/YA novel, Never Ending, from a leading book-review magazine in America. Kirkus Reviews, which provides influential critiques of novels ahead of publication, has awarded the U.S. edition of the book its prestigious star rating, reserved for work of “exceptional quality”. 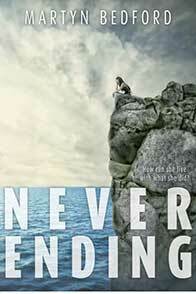 Wendy Lamb Books, part of the Random House group in New York, is publishing Never Ending in March. This is the second time I have received a coveted Kirkus star for my teenage fiction, following the success of Flip in 2011. An English teen can’t stop blaming herself for her brother’s death. Thanks to the headlines, all of Europe knows what happened to 15-year-old Shiv’s brother one fateful night in Kyritos, Greece. Since then, she’s been experiencing PTSD-like symptoms that put her into rages she can’t remember and send illusions of her brother creeping across her vision. The two-pronged narrative shifts between the fateful family vacation in Greece and Shiv’s inpatient therapy at the Korsakoff Clinic. What matters most is not so much whether or not Shiv had a hand in her brother’s death, as she so accuses herself, but the relationships she builds with the other teen residents of the clinic and the arc of her treatment. Each session of therapy opens another window to Shiv’s time in Greece before her brother’s death — her crush on a handsome, 19-year-old Greek boy, days spent relaxing by the pool with her parents at the villa and the terrifying night her brother lost his life. The characters and the scenery are rendered with such photographic precision that readers will feel as though they’re watching a film. They’ll also find Bedford’s compellingly blunt, sharply drawn narrative (laced with Salinger references) sometimes too painful to read as they experience the harsh treatments right alongside Shiv. The results, however, are absolutely worth it. Beautiful and illuminating but as hard as therapy.